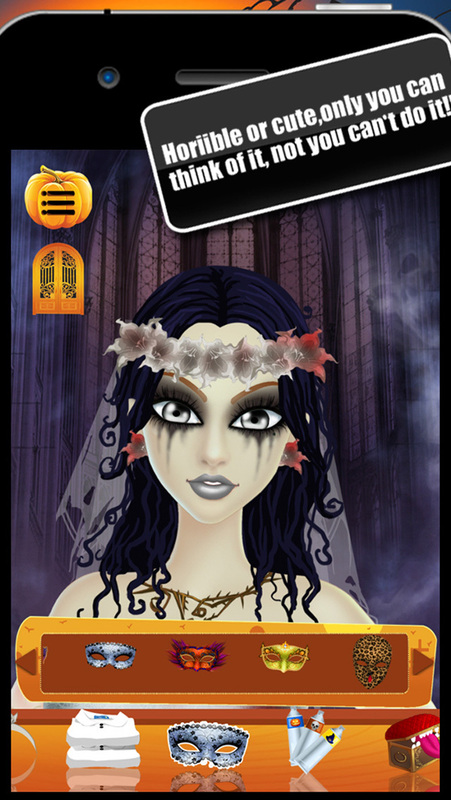 Halloween makeup for girls here again! The girls need your unique style to show their personality now!! 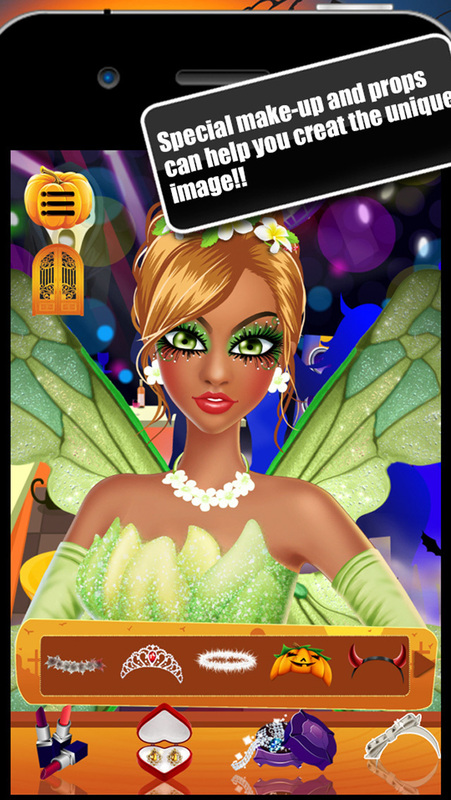 Maybe you can't play with your frends on Halloween, maybe you dare not make up appear exaggerated look. Don't worry!! Now the make-up model can help you!! Dress up her with different appearance as you prefer, and no worry about too exaggeration and failure. Just enjoy yourself in your own make-up lab. Here are four different model for you to choose!! And also glaring clothes and ornaments to fit your makeup!! Come on! A successful experience only needs 5 minutes! You can make millions of different faces, you can even join your favorite makeup into the reference of your daily life! Show your creative thinking as you can! You just need to touch any choice and section of the game, and the list will show it. The model's face and body will present Whatever you choose. 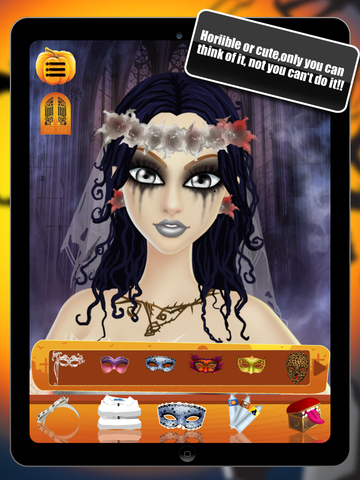 Now let's make this Halloween full of fun, and enjoy your own makeup world!! Share them with your friends by taking a photo of your masterpieces via FACEBOOK and TWITER or E-mail!! 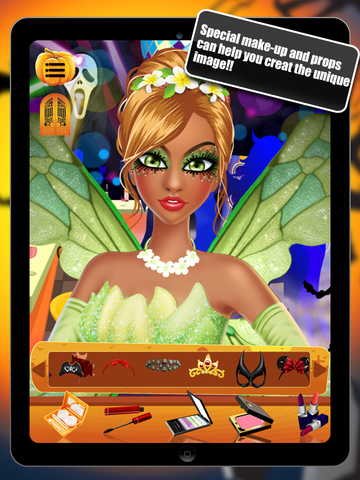 - So many themes for you to choose-- angel, witch, demon, vampire and so on. - Lots of dresses with different style. - Enjoy with a variety of lipsticks, eye-shadow, earrings, necklaces, complexion, mascara and much more. 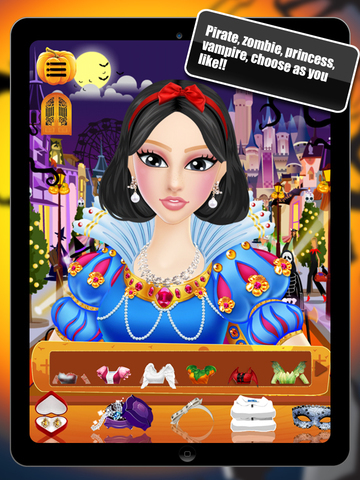 - Dress her up in the gown of your dreams. - Pick out a crown. - Lots of vivid scenery with different background music. - Share your make up girls easily over Facebook or E-mail with one click.